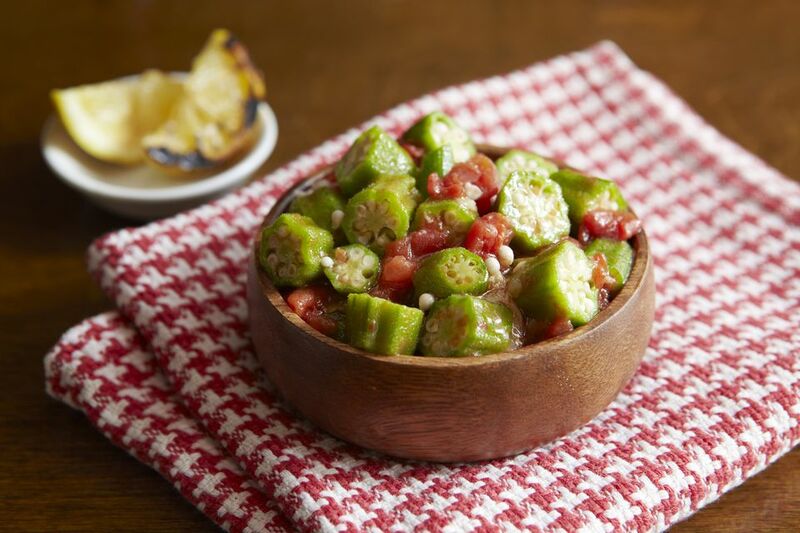 This is a quick and easy recipe for okra and tomatoes. It's made with only 4 ingredients plus salt and pepper. The dish is made with canned stewed tomatoes, bell pepper, and onion. This tasty Southern okra side dish is ready in less than 30 minutes. It makes an excellent side dish to serve with a leg of lamb or roast beef. Or serve the okra with baked fish or poultry. Wash the okra and slice off the stem ends. Slice it into 1/2-inch rounds. Place the sliced okra in a saucepan and cover with water. Bring the water to a boil and reduce the heat to medium-low. Continue to cook for 5 minutes. Drain the okra in a colander and then return it to the saucepan. Add the remaining ingredients. Simmer the okra and tomato mixture for 15 to 20 minutes longer, or until the okra is tender. Add kosher salt and ground black pepper, as needed to taste. Instead of salt and pepper, season the okra with a seasoned salt blend or Creole seasoning. "I've never tried okra before but as I liked all of the other ingredients I thought I'd try it... I must admit I really enjoyed it... the kids loved it too. I'll definitely try it again Thanks!" — James R.